My sudden stunned stop had the others bumping into me and we discreetly waited behind some bushes, chuckling and talking loudly. Another hiker arrived on the scene, first looking at us, bewildered why we didn't continue for the last couple of meters to the summit proper and then, realizing what was going on, laughing and joining us. The startled couple shuffled to get their clothes on and practically teleported of the mountain without a word or looking back. Funnily enough they had signed the summit book and praised the solitude of the place. Not so lonely after all. This is the "crime scene". We had a short rest on the summit and continued down a metal ladder towards the Rigi Scheidegg. This is a tiny village of vacation houses on a ridge. We had some cake and drinks and parted ways. Andreas and Ralf wanted to go down by cable car as planned. 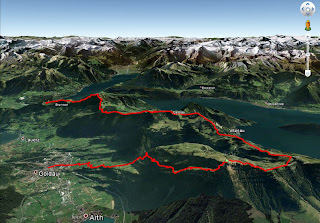 I decided to take advantage of the surprisingly good weather conditions and continue hiking the remaining summits of the Rigi ridge. The most exciting part of the trail behind me it was mostly burning kilometers by now. The area gets more and more touristi, culminating in the Rigi Kulm (1798m) with a big Hotel and restaurant on top. I earned some surprised stares when I opened an almost invisible gate in the fencing around the observation area and walked off what looks like a vertical cliff from above. In reality it's just a regular white-red-white hiking trail and not even particularly steep. View from Rigi Kulm towards the two Mythen in the background. The train station in the center of the image is my destination. When we separated we had climbed ~1800m. 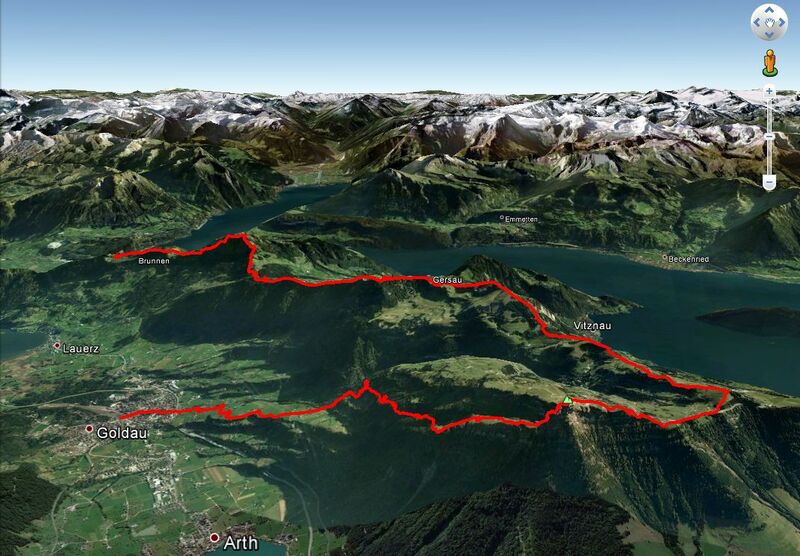 By the time I reached the train station in Arth-Goldau I totaled ~2500m up and down again, covering a distance of ~27km. We started walking at 09:00 in the morning and I arrived at 18:30 in the evening. My step counter for the GCC read 45.000. Long day!